Many years ago, I came across a tip in a magazine. It said to use bits of thickened liquid foundation that has gathered at the mouth of the foundation bottle as a concealer. You might have come across that tip too. That tip did not appeal to me. Usually, the foundation that pools at the mouth of the bottle is thick,gunky and quite gross and I don’t really want to use that. But that was in the day of thick cakey liquid foundations. When they started making liquid foundations that were lighter and more watery in texture and started putting liquid foundations in bottles with pumps, that tip disappeared along with the gunk. Well, I’m back to teach you a similar tip! ….. But not 🙂 You don’t have to make use of any old gunked out foundation. You just apply the principles of layering. For this tip, you will need a liquid foundation that can be layered to at least medium coverage. If its too sheer, it will not work. If its a foundation that looks cakey when layered, it will not work either. Apply liquid foundation as normal all over the face. I usually use the palm technique. Squeeze out a bit of liquid foundation on the back of your hand. Using fingers (or a brush if you prefer) spread the foundation on the back of your hand, and dab on the areas that need extra coverage. Blend. Repeat dabbing and blending until you achieve the desired coverage. Apply some powder to set if preferred. The benefit of using this method is that you save on purchasing concealer and you can be very sure that the colour will be an exact match for your foundation. Its also good when you travel so you don’t have to carry an extra item with you. As I usually use sheer to medium liquid foundations, most of the ones I use and that I like, work. You can also use BB Creams if you prefer. 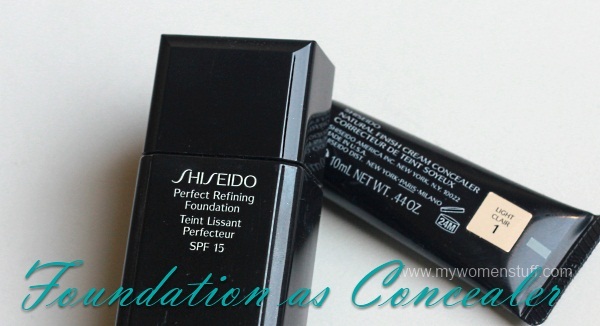 The foundations that work especially well are Bourjois Healthy Mix and Shiseido Perfect Refining foundation. For some reason, these two allow me to layer and blend without too much caking or looking thick and I don’t need very much of either even at the best of times. I used to use my Revlon Colorstay as a concealer also. ^.^ But in the end, my dark circles became darker and I had to use a proper one. Am loving MAC’s studio finish concealer. I used my laura mercier skin finish foundation also in that routine…but sometimes the under eyes is too dark..not sure which one is the best concealer for the eyes..any suggestion Paris? Undereye concealer is a big headache eh? I have a few I like – I Nuovi Undercover concealer (quite hard to find anymore), Lancome Effacernes concealer, Dior Skinflash, L’Oreal Touche Magique I find that for under eye concealer, its best to get one in a shade that matches your skintone as closely as possible with a touch lighter. Not too light though because it can then look very weird. Yay! It works well doesn’t it? When I have time (and going to somewhere nice), I’ll put a layer of my Everyday Minerals Intensive foundation, then use a small brush to pat on extra foundation on blemishes/scars, then depending on how it looks, use a kabuki lightly all over my face to blend it out. Gives me virtually perfect-looking skin everytime! Just that I hardly even do this, because all that precise dotting and blending takes time 😛 Most of the time, for work, I just brush on the foundation and it’s good to go! Thanks for reminding me about mineral makeup. It does work as well too (although less so for powder foundation) and all that layering and buffing can create a very nice finish. But you’re right too – it takes so much time to get it looking perfect. When I am lazy I will do the same although the result are not that good probably my dark eyes circles are just tad too DARK to cover. Lol..
Yep. Its not as good as using a separate concealer but in a pinch or when feeling lazy, I like it 😉 A layer of powder over it usually does the trick for me. i NEVAH forget to bring along concealer! and if i ever do then i’m dead as well because i dont use foundation. =( but yes, back in the days when i used to use foundation, i did use this technique as well – with the revlon colorstay! When I’m in a rush, I’ll use foundation as a concealer instead. But usually for my dark circles, for pigmentation, it’s much harder to cover up but at least it’s not as obvious. I count myself lucky for not having big eye bags or very dark eye circles. Else I’d be at a loss as to what to do! I actually use stick foundation, Like Bobbi Brown or Shu Uemura Cream Cover Stick – just thicker than liquid foundation, but dense enough to cover problem areas. Oh yeah I used the Shu Nobara stick foundation too – its thicker and has better coverage but was too thick for the rest of my face eeps! i don’t use foundation on daily basis now..let alone concealer. but friend gave me a garnier eye roller for dark circle, and now i like it 😀 😀 2 in 1! im using a very light foundation with minimal coverage (lioele one) to even out my skin tone and then i use a bb cream with rather thick consistency ( bioessence brand) as a concealer. actually i just pat on the bb cream all over my cheeks where my acne scars are. haha. it doesnt cake and give me a really dewy glow. I do this when I travel cos I don’t like bringing too much stuff with me and it works pretty well. It doesn’t completely cover my dark circles but it makes a lot less obvious.